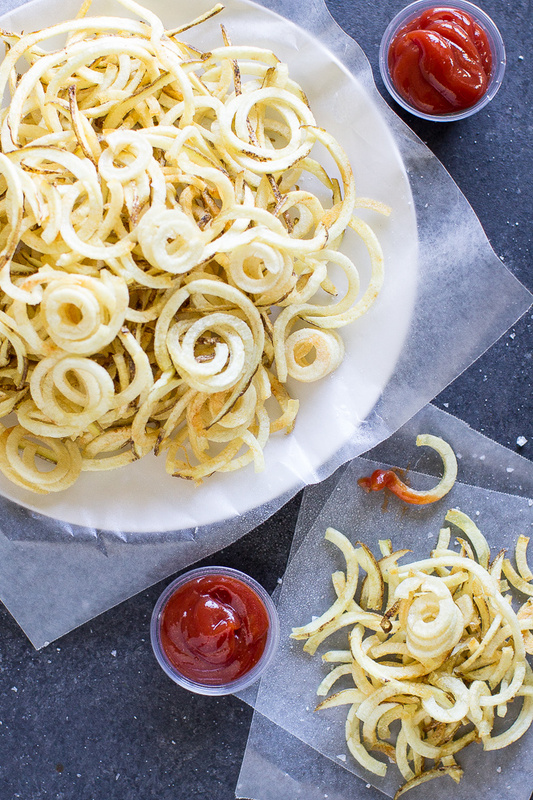 Welcome to your fool-proof guide on how to make Curly Fries! With the help of my secret weapon, turn regular or sweet potatoes into the crispy French fries of your dreams. I never pictured myself as a Spiralizer Owner (Disclosure: OXO Sent me their Spiralizer to try out, free of charge. All opinions are my own). I know you can use a Spiralizer for a million things this side of Wednesday, but the prevailing recipes are often for Zucchini Noodles. And I just don’t identify as a Zucchini Noodle Eater. If I’m going to Spiralize, I want to spiralize something DELICIOUS and FUN. Sure, I’ll try the healthy stuff eventually… but zoodles can wait. I wanted something compelling. Over the years, I’ve read a lot of information about how to make the best French fries. I’ve salvaged some of those tips and applied them here (such as soaking the cut fries in water to remove excess starch) and discarded others that seem exhausting (frying each batch twice). The result is: Crispy French fries prepared in a straight-forward manner that you’ll be proud to serve and delighted to eat. I used Russets and I left them unpeeled as you can see in the photos. Just give them a good scrub. See below for tips on using Sweet Potatoes. Trim the ends so they are flat, insert into the spiralizer, and give it a twirl. It works like a dream. 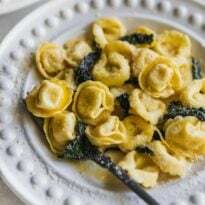 I really had no idea spiralizing was so easy. 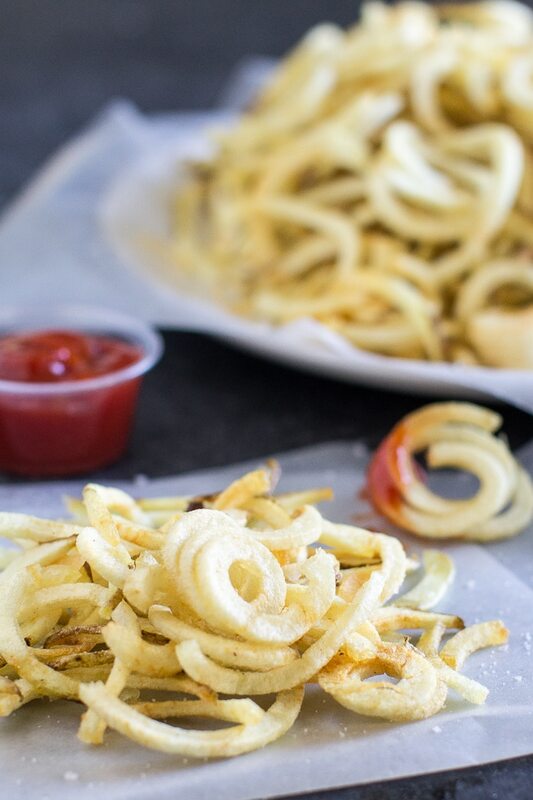 In under a minute you’ll have evenly-sized curly fries with zero effort. I used just one potato (although it was fairly large, close to a pound), and I got 3 to 4 servings out of it. 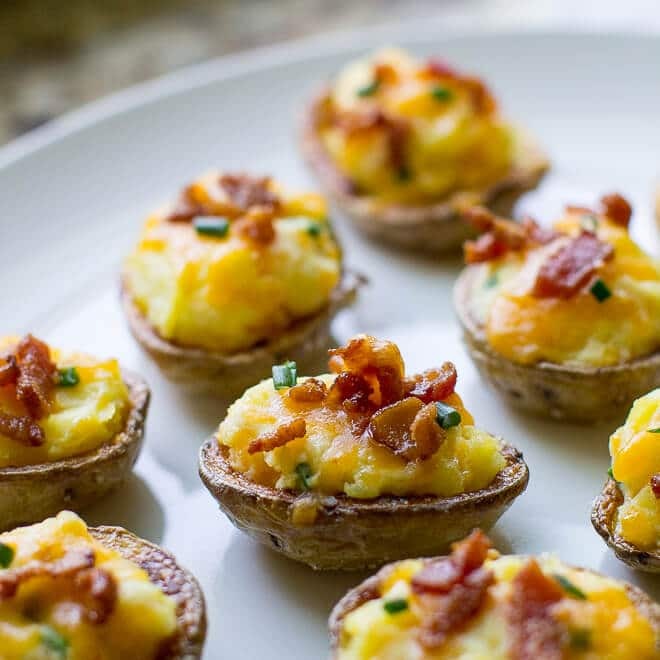 The serving size depends largely on your appetite and the occasion. Place the spiralized potatoes in a large bowl and cover with cold tap water. Ideally, they will soak for at least 30 minutes, although you’ll still get great fries out of it if they only soak for 10 minutes. If push comes to shove, just soak your fries for the amount of time it takes to heat your oil. Doing so will prevent discoloration, too. Next, heat your oil for deep-frying. I like to use my Thermoworks Chef Alarm for deep-frying because it gives me a constant read on the oil temperature. Bring the oil to 350ºF before you begin and again between each batch. 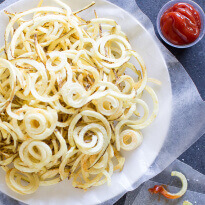 Immediately before deep-frying, transfer your fries to a kitchen towel and dry them as much as possible. The moment you drop the curly fries in the hot oil, any excess water is going to boil off and it may cause your pot to overflow. The moment you drop fries in the hot oil, the temperature of the oil begins to drop. How much it drops depends on how many fries you put in. Therefore, try to work in small batches as much as possible. My instinct is to do the opposite (because I want tons of fries ASAP), but it just ends up taking longer because of the drop in oil temperature. The actual frying time depends on how much your oil temperature drops. It might take anywhere from 5 minutes to 10 minutes to fry your potatoes to crisp, lightly browned tendrils of delight. 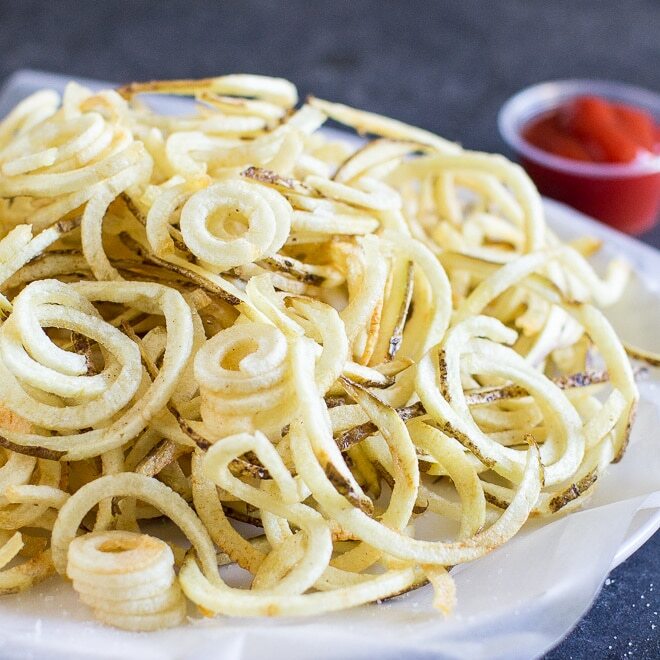 If you drop in your curly fries and the temperature stays above 300ºF, your curly fries will likely be done in 5 or 6 minutes. However, if the temperature drops to 275ºF or even lower, than plan on 8 to 10 minutes. Watch for your fries to begin to turn light brown in color. 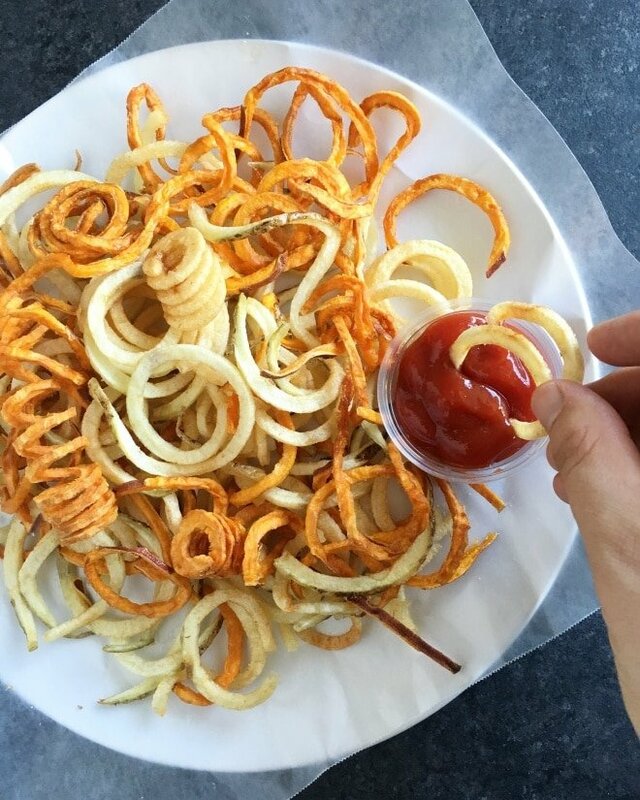 Remove your fries using either tongs or a strainer and transfer to a plate lined with paper towels. 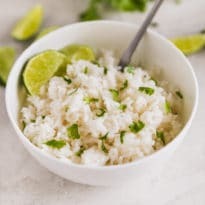 Immediately season them with salt. Repeat with all your remaining fries, working in batches (they should still be soaking in water, so dry them as much as possible and then fry them). Be sure to return your oil to 350ºF before continuing. I have made Sweet Potato Fries in the exact same manner and they worked very well. So, just follow my steps above and/or the recipe below. You are still watching for the sweet potatoes to turn light brown in color. However, if you want to make a White and Sweet Potato Curly Fry Mix, it gets slightly trickier. The orange from the sweet potatoes will make the white potatoes “appear” that they are lightly browned before they are, so consider extracting one for sampling before pulling the whole batch. Also, give them a solid 5 to 7 minutes to fry. 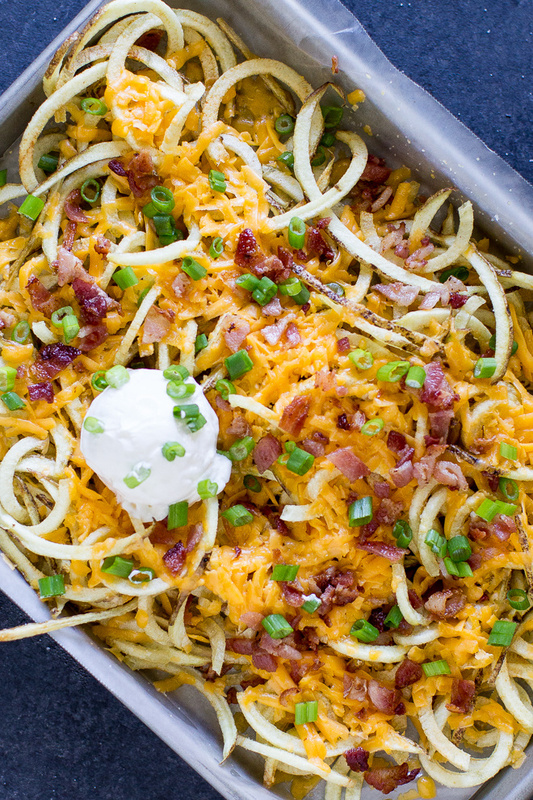 In conclusion: Spiralizing is fun and delicious and you must try it IMMEDIATELY! Thanks to Oxo for a truly life-changing gadget. Prepare the OXO Spiralizer with the orange blade. 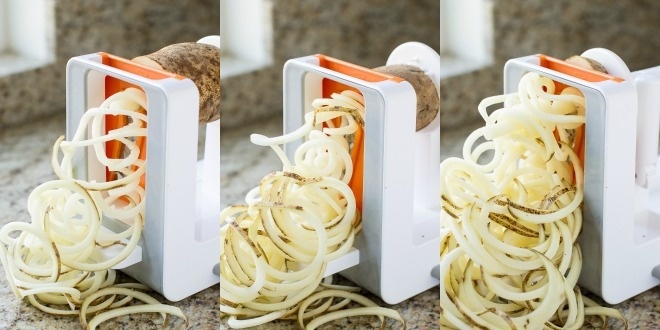 Trim the ends of your potato so they are flat and place on the Spiralizer. Spiralize the potato. 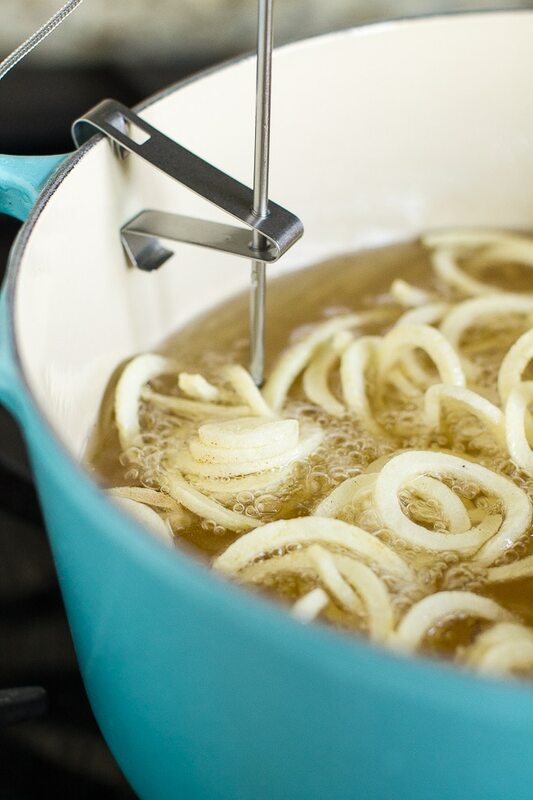 Transfer the spiralized potatoes to a large bowl and cover with cold water. Soak the potatoes in the cold water, preferably for 30 minutes, but at least for the amount of time it takes you to heat your oil for deep-frying. Preheat oven to 200ºF. Heat vegetable or canola oil to 350ºF. Working in small batches, dry some of the curly potatoes on kitchen towel to remove excess water, then immediately drop in heated oil. Fry until the potatoes begin to look light brown in color, 5 to 10 minutes depending on the size of the batch and how consistent the oil temperature is. Immediately transfer to a plate lined with paper towels and sprinkle with salt. Place in the oven to keep warm. Return the oil to 350ºF. Repeat with the remaining curly fries, continuing to work in batches. Serve warm and refrigerate any leftovers. I want. I want it ALL :P Looks so good ..Love what you did with the fries there…the loaded one is killer. Good morning Dave! It’s important to keep The Boss happy. :) Yeah these fries are just outstanding. The kind of thing that requires lots of “recipe testing” if you know what I mean. 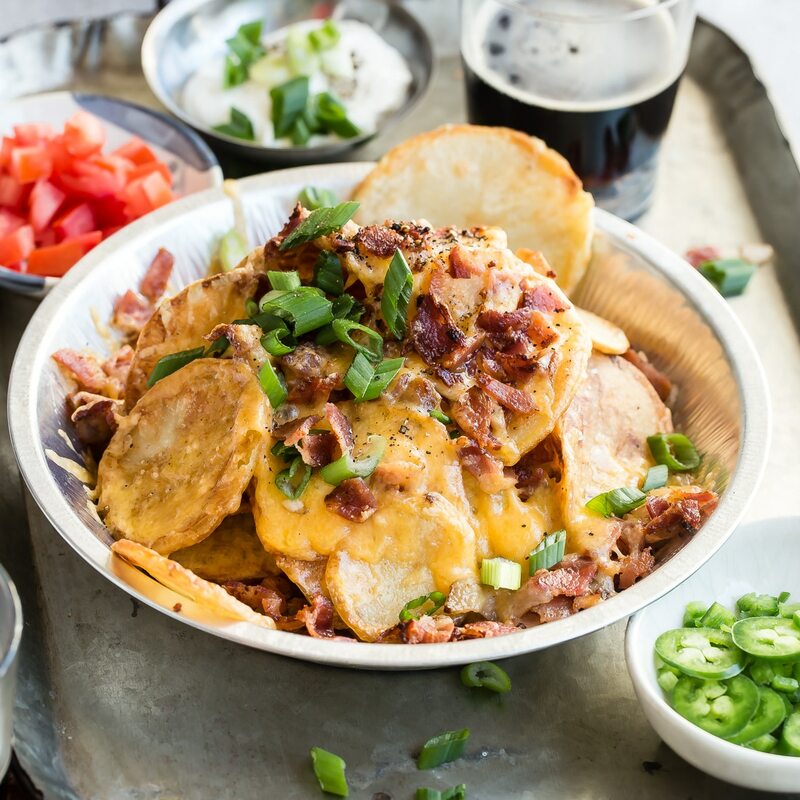 I’ve yet to use my spiralizer for curly fries (mostly because I’m still a little afraid of frying) but the picture of those loaded fries is making my mouth water so I’m going to have to try this. That’s sound great!!!!!!!!!!!!!!!!!!!!!!!!!! My daughter will love it most :) she love french fired and now I will do curly fired for her!!!!!!!!!!!!!!!!! Thanks for showing the Chef Works thermometer. I needed a clip for mine (a different brand-pairs with my phone) so I ordered a clip. I somehow missed this post last year. My Mrs loves seasoned, curly fries. Thanks. When I fry my sprial cut fries they don’t spread out they stay in a clump, what am I doing wrong? Should I soak them in water first? Do i soak sprial cut potatoes before i fry them? Hi Sandra, I don’t think soaking them in water will prevent them from clumping. What you need to do is pull them apart before you drop them in the oil (so they aren’t in a clump) and then not overcrowd the fryer (so they don’t clump together). Does that make sense? There are other reasons to soak potatoes in water, but it has to do with removing starch/changing the texture, not preventing clumping. Please let me know if you have any other questions or need more info! Thanks and take care. Yes I don’t see why not! Care to share your specs on how you bake the regular fries? 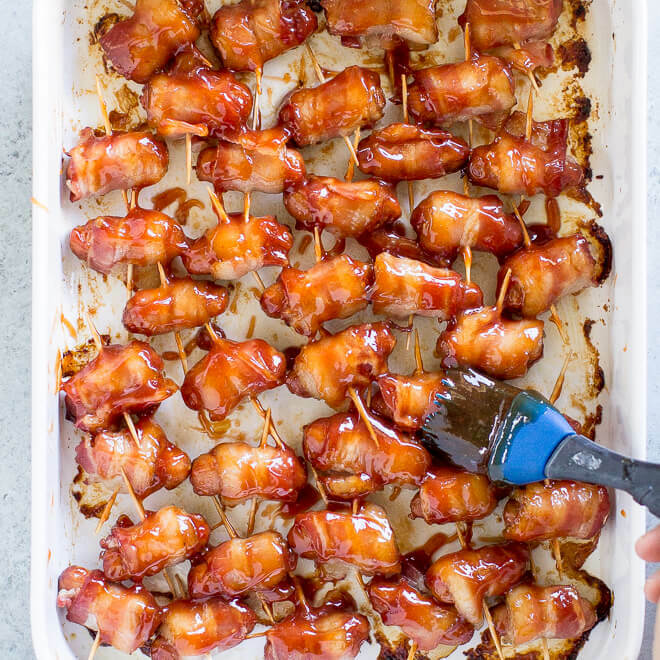 If not I’ll add this to my list of recipes to test so I can advise. Thanks Nadine!